Mr. and Mrs. John Miller of 1422 Richfield road, entertained the Twentieth Century class of the Central Christian church Friday evening at their home to announce the marriage of their daughter Ethel May and William Coller. They were married by Rev. L. H. Hayes of the Kearsley Park Evangelical church on July 19. Mrs. Coller attended the Flint high school, was graduated from the normal and is now teaching. Mr. Coller's home is in the northern part of the state, but he has lived some time in Flint, now being employed at the Buick. Both are active workers in the Bible school and young people's society of the Christian church. They will reside at 1422 Richfield road. Ethel Miller was a school teacher. She attended Genesee County Normal School in Flint, Michigan and received her diploma on June 22, 1917. It took a while to receive her education due to the fact that she could not be on a normal schedule - going at odd hours and on weekends. Mom finished high school in Flint at age 17 and was offered a scholarship by the Palmer Pen Company in Ohio. As I remember her talking about this, Mom was selected because she had such perfect handwriting. It was beautiful, flowing, exact, throughout all of her life -- and such perfection made me feel entirely incompetent when I compared my scrawls to her writing. It didn't matter if she was writing a grocery list, a note for school, or a letter, it was consistently perfect. Her penmanship was as beautifully formed as those penmanship books we used to use in schools. Palmer Pen made pens, but also sponsored a publishing arm that produced the "Palmer Penmanship Method" manuals, used in many schools. When Mom learned she had been offered this scholarship she was delighted, ready to leave for Ohio where she would train as a representatve of Palmer Pen and a trainer for teachers. However, Grandpa thought 17 was too young to leave home, and refused his permission. Instead, Mom attended the "Summer Institute" offered in Flint for training new teachers. By fall, she was assigned her first post in a one-room school at the edge of Flint -- I think that it was called the Dye School. After marrying William McKinley Coller the couple lived for a short time on the Coller farm in Sanilac County, Michigan. While living there Eldon Coller was born in 1919. Shortly after Eldon was born the couple moved to Ethel's parents house at 1422 Davison road in Flint, Michigan. Ethel's parents converted a small attic area into a living space for William, Ethel and Eldon. Ethel went back to teaching and William became an insurance salesman. Around 1924, William, Ethel and Eldon moved to Dartmouth Road in Flint, Michigan (northeast Flint). Eldon became ill with polio when he was 6 years old, but was on the road to recovery by 1927. Eldon got polio from a friend of his named Wally. He was exposed while living on Davison road, but the symptoms did not reveal themselves until the family moved to Dartmouth road. Wally died from the disease. Dartmouth Road was the family residence until their divorce in 1929 after about 12 years of marriage. One summer, when Eldon was about 4 years old, Ethel and Alice (her mother) bought a tent and drove through the eastern states camping along the way. 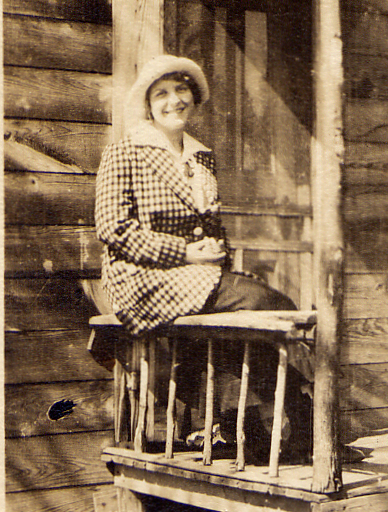 In the late 1920s Ethel took a traveling job selling educational material. She traveled through many of the plains and western states. Eldon Coller recalls perusing her sales samples. When the Buick plant expanded in Flint, Ethel bought two small, new homes as an investment and rented them to workers. After her divorce from William Coller, Ethel Miller married Edward Welsh. During the depression they lived in many places. In 1935 or 1936, Edward took Ethel, Alice and Fred to Peterborough, Ontario, Canada to live with his parents for the summer on their small farm. Eldon lived with his grandparents. Edward went back to the states and found work in a tool and die shop. He took a sliver of metal in the eye, which he lost, and received $600 as compensation. This money was used to purchase their first house which was a small, four-room cottage in Saint Clair Shores at 21631 Raymond Street. Eldon would stay with the family for two or three days at a time and then go back and live with his grandparents. He eventually moved in with the family and stayed there long enough to graduate from Lake Shore High School. Gracie was born in this home. From Raymond Street the family moved to Williams Street near Roseville and south of Mt. Clemens. When WWII was in its early stages everyone was employed or in the military. Edward started working 10-hour days, often 7 days a week, as a tool and die maker helping to manufacture aircraft and other military equipment. At the time Detroit was considered "The Arsenal of Democracy". This work allowed Edward and Ethel to purchase a farm in Armada, Michigan at 1205 North Road in 1942. It was 55 acres and they grew corn, apples and a variety of other fruits. They also kept bees. They had a roadside store where they sold their produce and honey. Edward would also take their produce by truck to stores in the area. Buildings were the main house, large barn, garage for the car, garage for the tractors (two), roadside store, small bunk house for the field workers, corn crib, a small rectangular building where the milk seperator was kept and a quonset style chicken house. There was also a large silo next to the barn. Edward worked in a machine shop to earn money while he was building up the farm. 1. Residence: 1422 Richfield Road, Flint, Michigan, 1918-1924. Source is address and postmark on mail. This probably should have been 1422 Davison. Ethel May Miller and William McKinley Coller were married in Flint, Michigan at the Evangelical Church by Rev. L. H. Hayes. Ethel May Miller and Edward Nelson Welsh were married in Toledo, Ohio by a Justice of the Peace on September 23, 1930.